…Meanwhile at the Josiah Locke’s Purissima Canyon ranch, love was in the air. 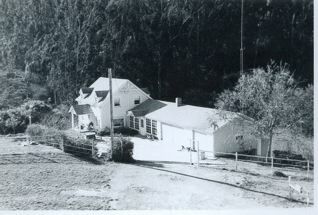 Flo’s brother, also called Horace, met and married Della Mae Johnson–the Coastside’s first woman dentist with offices in Pescadero and Half Moon Bay. One day Ralph Feusier’s great grandfather, Henry Feusier, a United States Geological Surveyor (USGS), came to Half Moon Bay and met and married Flo’s sister, Emily. And it was through that union that Ralph, the retired insurance executive, has a connection to the house on Main Street. Even before Ralph’s visit in 1930, Uncle Horace had demonstrated that he was much more than a farmer. During Prohibition Horace helped found the Bank of Half Moon Bay which had a branch office in Pescadero. In 1927 the two small town banks were taken over by A.P. Giannini’s famous Bank of America. Always seeking a business challenge, Horace Nelson looked at Half Moon Bay’s water company, bought it and later sold it. In 1938 Horace Nelson died at age 81 in Half Moon Bay. Ralph, then an adolescent, returned to the Coastside to attend his Uncle Horace’s funeral. Ralph Feusier didn’t locate the house on Main Street on his visit more than 50 years later in 1993–but he didn’t return to New England empty-handed. I had provided him with a possible trail. Katherine Pitcher Valentine was a retired teacher and the daughter of John Pitcher, the pioneer Coastside judge. She had a wealth of knowledge about lcoal history. Ralph and Katherine talked on the phone. Most importantly, Mrs. Valentine had provided the essential clue–the location of the Nelson’s Victorian house. She placed it kitty-corner to what is now the lovely new Cetrella Restaurant on Main Street. Finding the location of the Nelson house validated Ralph Feusier’s precious boyhood recollections. His search was complete–and he has since passed away. Previous PostPrevious Happy Thanksgiving from Half Moon Bay….